Where we studied them, the Ituri Forest, a single female Okapi would range over approximately 2 sq mi (5-7 sq km) of forest that was uniquely her “own”. All her food comes from this bit of forest. Male okapis cover greater area but have less exclusive use of it (ranges of 4 to 7 sq mi, or 10-17 sq km). Males only spend time near females when they are in estrous and receptive–relatively rare. 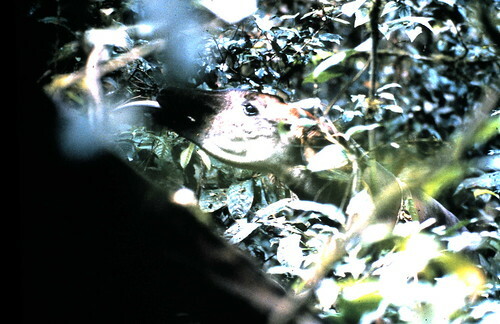 A female’s own young stays in its mother’s territory for up to eight months, then moves off to find its own corner of forest. An okapi eats only leaves. The lower level of the tropical forest is shady and leaves of the shrubs and lianas that make up the okapi diet are thinly distributed and slow-growing. Although the okapi eats new leaves, its diet is mainly of fully mature leaves. It avoids,however, old leaves that are covered with “epiphylls”, or mosses and algae. Nor do okapis eat any of the non-woody, mainly large-leaved herbs of the forest floor. This wild okapi, Bahati, feeding in the Ituri Forest, is one of the okapi that we radio-collared in the late 1980s. An okapi uses its tongue to strip leaves from branches in the shady understory. The okapi’s closest relative is the giraffe of the savanna that also uses its tongue to strip leaves from branches. Other forest ungulates consider “okapi leaves” inedible. The only animal that eats similar foliage is the elephant but it eats many other plant parts, as well (fruit, seeds, bark). The pygmy antelope, like okapi, is a strict folivore, but only eats “tender” leaves from plants that grow up quickly in forest openings or along forest edges. A pygmy antelope weighs 4 to 6 pounds whereas an adult okapi often weighs over 500 pounds. That is a lot of weight to maintain with leaves most animals consider unpalatable! In all there are 13 hoofed animals in the Ituri Forest, more than half of which have a diet dominated by fruits and seeds and none, except the okapi, committed to a leaf-only diet in the shady understory. In the Ituri Forest an okapi‘s diet is made up of over 100 different species of leaves. When John tried to reduce a captive okapi’s diet down to just a few species, it got blood in its dung and stopped eating. This was in spite of the fact that he included its “favorite” leaves. When he offered a greater diversity of foliage, including species okapi only ate in small quantities in the wild, the okapi came back on feed and returned to normal. A possible explanation comes from the fact that many understory leaves of the tropical rain forest contain toxic compounds to discourage leaf-eaters (insect or mammal). This makes sense from the perspective of the plant because in the low-light environment it is “expensive” to grow leaves that require sunlight for photosynthesis. But each plant’s toxins are unique. So by eating a wide enough diversity of plants the okapi avoids poisoning itself with too large an amount of any one toxin. This okapi infant named Karl was born in the enclosures in Epulu and named after Karl Ruf a conservationist in DRCongo who was killed in an accident during a diplomatic mission to protect the Okapi Reserve during the recent War in Congo. The caloric requirements of a lactating (nursing) okapi mother sky-rocket. Her leaf intake increases by 60% to 80%. She stays within her territory but strips it of the edible leaves within reach. A new-born okapi calf “nests” while its mother is out foraging. During its first six to nine weeks, an okapi calf stays alone on the forest floor immobile while its mother is out foraging. The mother returns only briefly to nurse her calf. Young usually do not defecate in their first month, assuring that it remains invisible not only to the eye but also to a leopard’s keen sense of smell. First solid leaves are early. In captivity an okapi calf may take some leaves at three weeks and actually starts to ruminate by six weeks. This photo by Kim Gjerstad shows the length of the Okapi’s giraffe-like tongue. Mysteries remain about Okapi in TL2. What DO they eat? Okapi have a patchy distribution in the TL2 landscape. Although the forests are diverse there may not be enough palatable leaves – too much poison, too few nutrients? 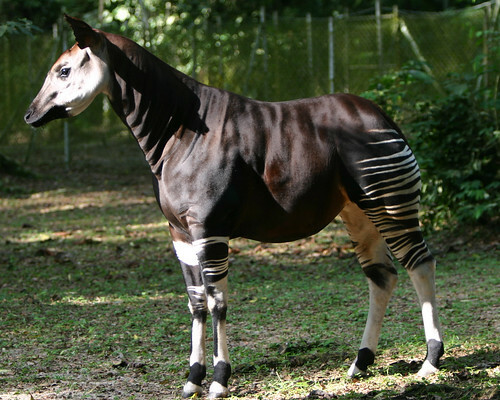 Okapi avoid large areas of forest growing on nutrient poor sands between the Lomami and the Lualaba. John believes that these, and possibly other gaps in their range, are really pockets of forest too nutritionally poor to support okapi. In the areas of the TL2 forest where they are more abundant, are they eating the same species as they do in the Ituri or is it a whole new diet? I think we have some botanical work to do! 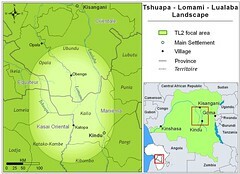 The information above is from John and my work in the Ituri Forest from 1985 to 1990. We thank Wildlife Conservation Society for support of this work. Also included here are the observations and research of Steve Shurter, Karl and Rosemary Ruf, George Rabb, Richard Bodmer, S.L.Lindsey, M.N. Green, and C.L. Bennett. Our own work is shown here and in film here. 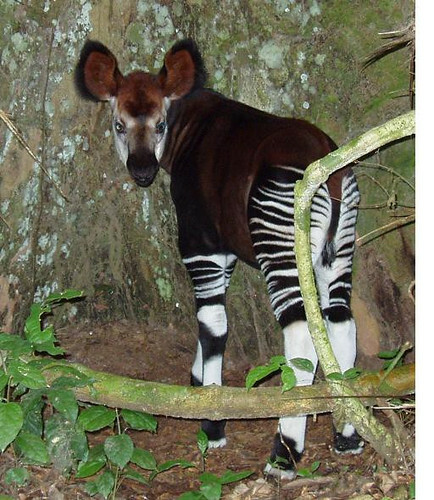 Current information from the Okapi Reserve which is a world heritage site because of okapi. 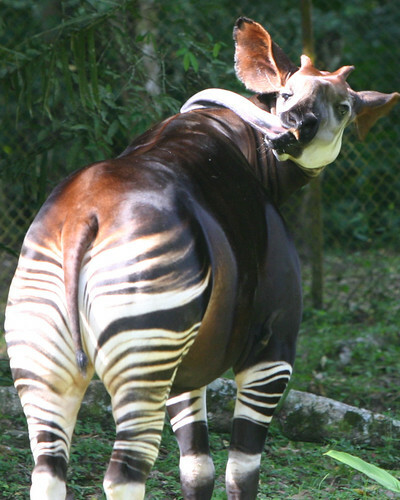 More information about okapi can be found here and here and about its forest here. This entry was written by Terese Hart, posted on 2009-01-06 at 4:04 am, filed under Okapi. Bookmark the permalink. Follow any comments here with the RSS feed for this post. Both comments and trackbacks are currently closed. I remember taking these photos of captive okapis in Epulu in 2006. I believe there are 15 of them in total, each with their own dens. By all means these are solitary animals. So shy, the female I took photos of would always end up up at the opposite side of the large enclosure. It took me 45 minutes and the help of a caretaker to finally pet it.